Looking to buy quality bocce ball courts? Custom Turf Outlet has the highest quality bocce ball courts you can buy, user all across the country for both commercial and residential uses. Bocce ball is a great game for just about everyone. It can be played between two players or two teams of multiple players. The game starts with each player receiving 4 balls, and a smaller ball called the polino. After the polino is thrown into the target zone, players take turns trying to get their balls as close to the polino as possible. The player or team who lands closest to the polino gets a point, and the first to get 12 points wins. Bocce ball courts can be enjoyed by everyone from kids to seniors, at any skill level. 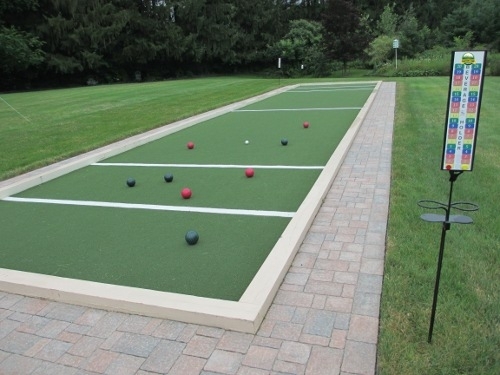 If you want a quality bocce ball that will endure all weather elements, look no further than Custom Turf Outlet.